Drinking high-protein milk at breakfast can help diabetics keep their blood glucose under control, a study has found. Researchers from the University of Guelph and University of Toronto in Canada showed that a change in breakfast routine may provide benefits for the management of Type-2 diabetes. 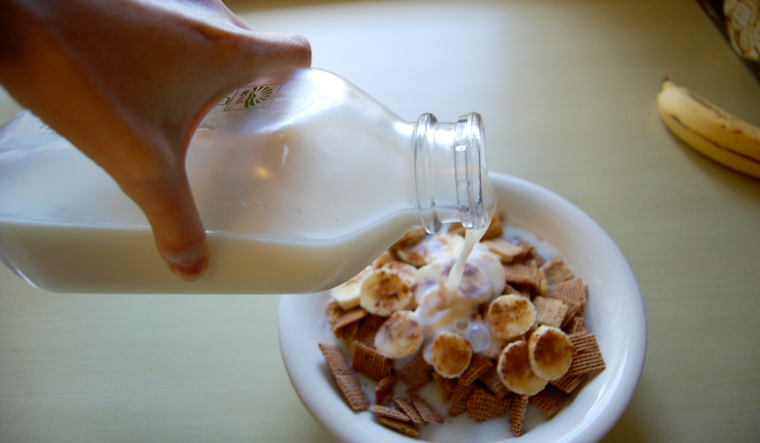 Milk consumed with breakfast cereal reduced blood glucose concentration compared with water, and high dairy protein concentration reduced postprandial blood glucose concentration compared with normal dairy protein concentration. "Metabolic diseases are on the rise globally, with Type-2 diabetes and obesity as leading concerns in human health," said Douglas Goff, from the University of Guelph. "Thus, there is impetus to develop dietary strategies for the risk reduction and management of obesity and diabetes to empower consumers to improve their personal health," said Goff. The team examined the effects of increasing protein concentration and increasing the proportion of whey protein in milk consumed with a high-carbohydrate breakfast cereal on blood glucose, feelings of satiety, and food consumption later in the day. Digestion of the whey and casein proteins naturally present in milk releases gastric hormones that slow digestion, increasing feelings of fullness. Digestion of whey proteins achieves this effect more quickly, whereas casein proteins provide a longer-lasting effect. The study, published in the Journal of Dairy Science, confirms the importance of milk at breakfast time to aid in the slower digestion of carbohydrate and help maintain lower blood sugar levels. Nutritionists have always stressed the importance of a healthy breakfast, and this study should encourage consumers to include milk, researchers said.